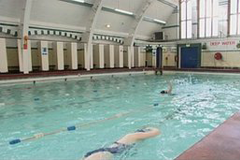 A historic swimming baths in Birmingham could close in 18 months unless the community can fund it. Moseley Road Baths opened in Balsall Heath in 1907 and is the oldest of three Grade II* listed swimming baths operating in Britain. Campaigners from Friends of Moseley Road Baths want the council to bid for Heritage Lottery money to help fund its restoration. The authority has said budget cuts mean it cannot afford to run the baths. Councillor Lisa Trickett said: "As a swimming pool run by the council with public funding then yes, we have major problems in terms of the future of Moseley Road Baths. "At this point in time it could cost £20m, £24m to put it right in the most basic sense." In December, the Labour-run council said it did not have the funds to match a £3m promise made by the Conservative-Liberal Democrat coalition to refurbish the baths, which would have been used alongside a Heritage Lottery Fund bid. A spokesperson, at the time, said the situation would be reviewed at a later date, which may enable another bid for Heritage Lottery Funding. The small pool is currently open, but the gala pool shut a decade ago because of safety concerns. The building still has many of its original features, including more than 60 individual changing cubicles. A blog on the Friends of Moseley Road Baths website, said that the council confirmed it would remain open "for as long as is feasible" until Sparkhill Baths reopen in March 2015. Rachel Gillies, from campaign group, said: "We talk about the Olympic legacy, well let's ensure that children have got that opportunity to learn a life-saving skill. "Unless we invest in our neighbourhoods then we will see this wonderful building become derelict."